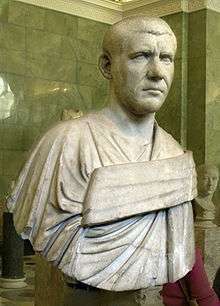 Marcus Julius Philippus (Latin: Marcus Iulius Philippus Augustus; c. 204 – 249), also known commonly by his nickname Philip the Arab (Latin: Philippus Arabs), also known as Philip, was Roman Emperor from 244 to 249. He was born in the Roman province of Arabia, in what is now present-day Syria and went on to become a major figure in the Roman Empire. 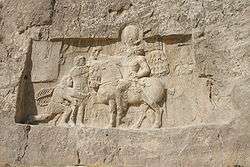 He achieved power after the death of Gordian III, quickly negotiating peace with the Sassanid Empire. During his reign, Rome celebrated its millennium. Coin of Marcia Otacilia Severa, wife of Philip. The Greek legend states she received the title of Augusta. ↑ In Classical Latin, Philip's name would be inscribed as MARCVS IVLIVS PHILIPPVS AVGVSTVS. ↑ Cruse, C.F., translator. Eusebius' Ecclesiastical History, Hendrickson Publishers, 1998 (fourth printing, 2004), pp. 220–221. ↑ "Catholic Encyclopedia: Sts. Quirinus". Newadvent.org. 1911-06-01. Retrieved 2009-02-17. Herbermann, Charles, ed. (1913). "Philip the Arabian". Catholic Encyclopedia. New York: Robert Appleton Company.